- We guarantee the lowest prices! - Gift with the purchase! 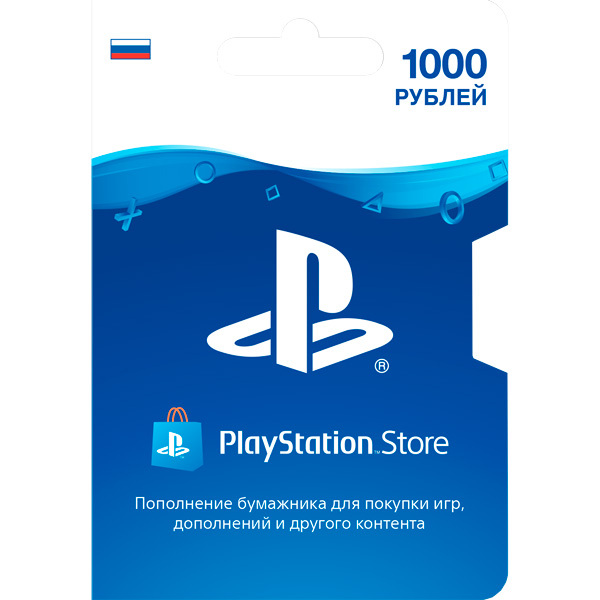 Payment card PlayStation Network 1000 rubles Russia (RUS). A PSN payment card of 1000 rubles allows you to replenish the balance of a virtual PlayStation Store wallet for 1000 rubles. Instant receiving code as text. 1. Create a Russian PlayStation Network account at http://eu.playstation.com/registration or use your existing one. 2. Login to the Playstation Store using PlayStation4, PlayStation3, PSP, PSP Go, or on the website. 3. Select the "Redeem Codes" item (on PS VITA, click on the "Parameters" icon at the bottom of the screen). 4. Enter the 12 characters of the promotional code and click "Continue." 5. Then follow the instructions on the screen to redeem your promotional code. If you get an error when typing from the console, you must enter the code through the site. ATTENTION!!! This PSN card is 1000 rubles only for RUSSIAN (RUS) accounts, the wallet currency must be RUB !!! In our store there is a flexible system of discounts, for regular customers there are specials. conditions! We guarantee the correctness of the recharge card code, we solve all the issues we have promptly! My contacts Telegram, Watsapp and email. mail are on the page "Information about the seller and its products." For any questions you may contact me through these contacts or in a personal message here on the site.